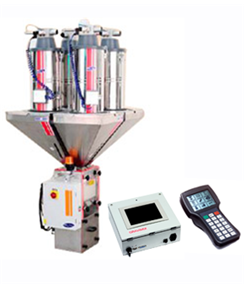 AGB Series Gravimetric Dosing & Blending unit is economical, reliable and user friendly blending systems. It is suitable for Large extruders, blow molding machine, The system is designed for efficient dosing fo free flowing thermoplastic materials. Presents new Gravimetric Dosing & Blending System AGB series in collabration with M/s Ferlin B.V. Holland. The AGB Series blender are economical, reliable and user friendly blending systems. be delivered with an economic plug-in interface (microprocessor controlled) or a sophisticated industrial PC with touchscreen. All material hoppers can be equipped with low-level sensors for an additional warning (option). If necessary the system can be supplied complete with hopper loaders. The system will weight oanaccuracoyf1/100 of a gram. Depend eonnt the inter fatchee, displawyilslhowtheweighotf eacchomponeinn1tgramor1/1o 0f a gram.